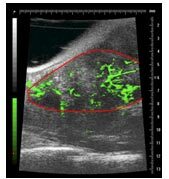 The UPMC Hillman Cancer Center Small Animal Ultrasound Imaging service provides expertise and equipment that enable researchers to quickly, easily, and inexpensively answer technical questions related to in vivo events in small animal rodent models. Provides primarily structural information in real time, so allowing non-invasive determination of organ paramaters (such as tumor size) in three dimensions, as well as following events related to cardiac function and blood flow. Use of targeted or non-targeted contrast agents can provide additional information regarding perfusion rates, receptor biodistribution, etc. Use of targeted microbubble disruption allows targeted delivery of drugs or genes to specific organs. 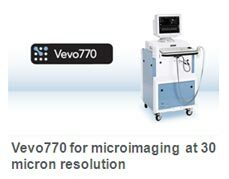 Vevo 770 small animal ultrasound (Visual Sonics), enabling 3D volume rendering (for tumor measurement) and contrast enhanced ultrasound (for receptor-ligand biodistribution profiling or vascularity and perfusion quantitation). Three transducers designed for use in different rat or mouse models. Microbubble disruptor (SoniGene) device allows the focused disruption of microbubbles carrying small molecule or gene-based therapeutics in a living animal.